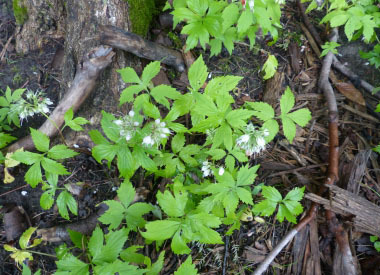 The Virginia waterleaf is not a well-known edible yet when young it tastes pleasant. This plant is primarily on the eastern half of North America, but it has western cousins, the California waterleaf (Hydrophyllum occidentale) and the Pacific waterleaf (Hydrophyllum tenuipes). Although this plant is fairly competitive with other plants, there are some areas such as New Hampshire in which this is becoming endangered. 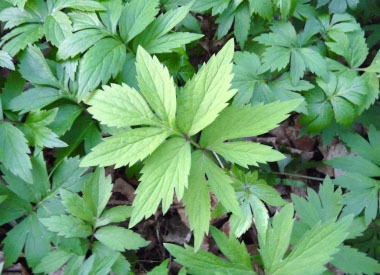 Virginia waterleaf was once used to help with several minor health ailments. The chewed root, or decoction was used for dry lips and sore mouths. It grows well in areas in which there are sugar maples (Acer saccharum), white ash (Fraxinus americanum), American beech (Fagus grandifolia), and yellow birch (Betula alleghaniensis). Many gardeners with the right environments enjoy this plant as a form of groundcover. Distinguishing Features: This plant has deeply-lobed leaves. 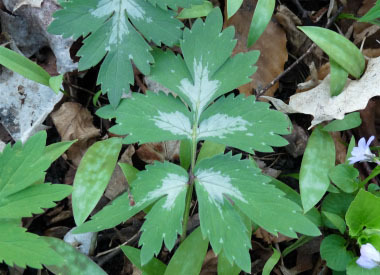 When young, some of the leaves have white, watermark-like markings; these markings disappear as the plant matures and the leaves turn darker green. It is an aggressive plant so it is easy to spot it when in the right locations. This woodland perennial has what apprears to be a somewhat weak-stemmed plant with hairy upper parts. Flowers: Dense flowers occur in clusters as a cyme scorpioid (head-like). 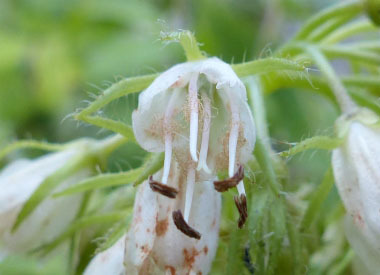 Flower stalks are 3 to 5 mm long. They are white to dark violet, bell-shaped, up to 1 cm long. They have five petals, five hairy sepals, and five long-stalked, hairy stamens.They tend to bloom anywhere from mid to late spring depending on geogrpahic location and seeds occur in July or August. 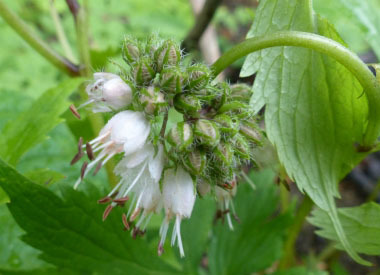 Fields of Nutrition has medicinal benefits and vitamin/mineral content of Virginia Waterleaf. Leaves: The leaves are alternate, stalked, 10 to 20 cm long, sometimes mottled green, pinnately divided into three to seven broadly oval to triangular lobes. The margins are coarsely toothed. Younger leaves may have what appears to be white markings but as the leaves mature they become darker green. Height: This plant can grow up to 80 cm tall but can be as short as 20 cm. The stem is covered with dense, stiff hairs and the rhizome is fleshy. 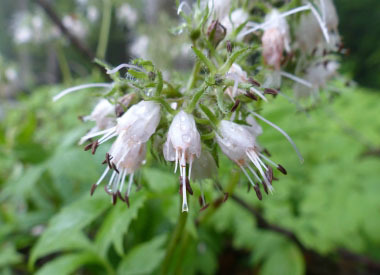 Habitat: Virginia waterleaf is always found in moist, wooded areas, typically is a stream or creek is near by. This plant generally occurs east of the Mississippi in the U.S., and from Ontario to the east coast in Canada. Edible parts: Leaves can be used raw or cooked. Young leaves are mild-tasting and refreshing. They make a pleasant addition to the salad bowl, or added into sandwiches. Leaves become slightly bitter with age. Use in baked dishes and smoothies. Tea can be made from the roots. It is an astringent, used in treatment of mild diarrhea.